The world was created in seven days; therefore, in Hebraic thinking, the number seven represents the perfection or completion of a cycle and also the natural realm that we experience with our physical senses. The number eight, which follows, indicates a new beginning and also takes one beyond the limits of the senses and signifies the transcendent, unseen spiritual realm. We are aware of this spiritual dimension, and can be emotionally moved and mentally stirred by, but it is one we cannot physically reach out and touch. It can only be ‘seen’ with eyes of faith and with the heart. The festival of Hanukkah challenges us to see beyond the temporal reality of our circumstances and to grasp the reality of the transcendent; to focus on that which will endure for eternity. The eight days of Hanukkah are thus extraordinary days, during which we are given the opportunity to “see the light” both physically and spiritually. We are encouraged to look both within and beyond ourselves, and to deepen our understanding of God’s eternal Kingdom. Each night, as we light a growing number of little dancing lights, we see their combined light grow in radiance and beauty. They call us to aim for greater unity and harmony between the transcendent and the worldly, the holy and the mundane, the spiritual and the physical. Two important themes clearly emerge as one explores and experiences the festival. One illustrates the power inherent in a diminutive flame to banish a world of darkness, and another reminds us that there is an indomitable flame in the spirit that enables people to reach far beyond their perceived natural limitations. The seven-branched Menorah was lit by the High Priest every morning and evening, first in the Tabernacle and then, once it was built by King Solomon, in the House of God, the Holy Temple in Jerusalem. The perpetually burning flames reflected the light of the Presence of God and of His Word. Throughout history, great nations have sought to overcome and even extinguish this light together with the Covenant people of God. Hanukkah relives the story of one such attempt and celebrates the victory of a small Jewish band of men who stood up for the God of Israel against impossible odds and, with His sovereign help, overcame the enemy and restored the light to His House. In the year 175 B.C., the mighty Greco-Syrian army took control of Judea, under the leadership of Antiochus IV. By 168 B.C. the Holy Temple was desecrated, the worship of Israel’s God was forbidden by law, and the values and lifestyle of Hellenism were enforced – on pain of death. Many Jews willingly embraced the Hellenistic way of life and assimilated as thoroughly as possible, which expedited their acceptance and ability to function successfully within the new system. There were many God-fearing Jews, however, who chose to remain faithful to the ways of the Hebrew Scriptures and readily gave their lives rather than submit to the yoke of man-exalting Hellenism. One small family, an elderly kohen (priest), Mattitiyahu (a son of the High Priest,Yochanan) and his grown sons, lived in the village of Modi’in not far from Jerusalem. They stood firm in the face of the tyranny and refused to bow down to the false gods. More and more faithful Jews rallied around them, until the tiny rag-tag band, who became known as the Maccabees, challenged the might of the Greco-Syrian army. Their intimate knowledge of the terrain was a great benefit but their main strength was the awareness of God’s presence with them. Although it is not the primary focus, the political/historical reality we celebrate at Hanukkah is the fact that the Maccabees defeated their foe, an army vastly superior in might, numbers, training and equipment. (The story is well recorded in the First Book of Maccabees in the Apocrypha.) After four hundred years of repression and persecution, the fact that the Judean state thus created was able to exist in relative independence for another two hundred years, while confronting a hostile world on equal terms, was a miracle in itself. Rabbinic literature almost totally ignores the military triumph of the Maccabees and emphasizes instead the miracle of the Temple menorah. A chief priority for the Maccabees, when they began to reclaim and restore their land after their victory, was to cleanse and rededicate the Temple in Jerusalem. 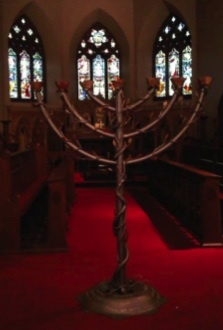 The sign of dedication, and the symbol of God’s Presence in His House, was the lighting of the golden, seven-branched Menorah in the Holy Place. The Maccabees found only one flask of uncontaminated oil fit for use in the lighting – enough for one day. It would take another week for the preparation, according to biblical standards, of more pure olive oil. So eager were they to restore the light to the Temple that they decided in faith to use what they had. What joy arose as the blessings were sung, and one by one the seven lights were lit and their radiance grew to bear shining witness to the presence of YHWH, the God of Israel, in their midst. They had done all in their power to restore His light to the darkened Temple. Now the Eternal, the Source of all Light, intervened and the flames of the Menorah kept burning day after day, for the next seven days, until the fresh store of oil was prepared. Thus, in 164 BC, at the rededication of the Temple, the festival of Hanukkah was inaugurated. The nine-branched menorah (the hanukkiah) is lit to commemorate the victory of light over darkness, and the miracle of the oil that kept burning for eight days. Only the watchfulness of the God of Israel over His people has kept the flame of the Menorah burning when all the forces of darkness in the world have tried to extinguish it. The fuel for the Menorah was the purest of olive oil, which was also used to anoint kings and priests. The prophet Zechariah’s vision of a menorah flanked by two olive branches, which provided oil for the lighting of the seven lamps, is illustrated both by the hanukkiah and on the emblem of the restored State of Israel (seen above). The two additional biblical Feasts, which are not listed in the Torah but are found in the book of Esther and referenced in the book of John, are Purim, which occurs before Passover (the first set Feast in Leviticus 23) and Hanukkah, which occurs after Sukkot or Tabernacles (the last set Feast). The two thus add two branches, as it were, to the ‘menorah’ of the seven Feasts and provide a nine-branched hanukkiah. Both Purim and Hanukkah tell of the threat of extinction of the Jewish people and God’s miraculous intervention on their behalf, which is subtle and hidden at Purim but shines brightly at Hanukkah. Loh be’chayil ve’loh be’choakh ki im b’Ruchi. “Not by might nor by power but by My Spirit,” [says the Lord of Hosts] (Zechariah 4:6). God is diligently watching over His Word to perform it, and if we as His Covenant people, both Israel and those from the nations who stand with her, are to shine His light into the world it must be with the power and anointing of His Holy Spirit, the Ruach HaKodesh. He provides the oil for our lamps. goodness, faithfulness, gentleness, self control. And if I have prophetic powers, and understand all mysteries and all knowledge, and if I have all faith, so as to remove mountains, but do not have love, I am nothing (13:2). When we light the lights each night we are reminded that Love lights all the others. As we participate with the Holy Spirit, in the love of Yeshua, the fruit of holiness will grow in our lives and, as a result, more of His light of truth and life will shine through us into the darkness of the world. The ways of this present, polluted age lead to meaninglessness, passivity and despair. They produce a bentness and brokenness, as opposed to standing upright in faith and walking confidently with the Lord in His ways. The assurance we have, just as the Maccabees of old, is that we are not alone! 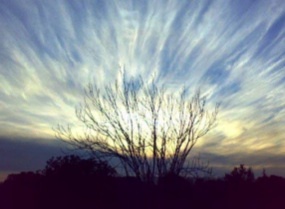 We do not rely on our own might or power, but on the enabling and the inspiration of the Spirit of God. On every hanukkiah the shammash, the helper or servant candle, is distinguished from the others. It is usually in the center or somehow set apart from the other eight. It is lit first every night and its flame is used to light the remaining candles. The shammash is a beautiful representation of our Messiah Yeshua, who divested himself of his heavenly glory and became a servant of all. Humbly, yet with the radiance of a single candle flame, he became the promised, anointed bearer of God’s light. Through him, the Word of life and truth would spread to illuminate the far corners of the world. 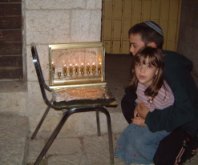 Traditionally, the hanukkiah is placed in a window or sometimes, as in the Old City of Jerusalem, outside the door to show that the light is not to be enjoyed by us alone but can shine like a beacon outwards to others. By the Spirit of the One true, living God, imparted to all in Yeshua, we can be transformed and reflect the image of God in which we were created. As we become more and more like Him, His glory will shine all the more into the world, bringing hope to the weary and despairing, holiness to the mundane, and the eternal to the passing and temporary. Let your light so shine before men that they may see your good works and glorify your Father in heaven. This entry was posted in Hanukkah Background and Insights by Cindy Lou. Bookmark the permalink.